Unique boats: What a way to ferry coconut husk! KERALA is God’s own country, dotted with backwaters and lakes, it is extremely picturesque. Panoramic palms and rich canopies of coconut trees add to the beauty of the verdant landscape. An out-of-this-world experience awaits you when you go cruising on the emerald backwaters of Kerala. It is a luscious world of greenery and tranquillity, made more sublime, by the sights of rare birds and myriad of native boats, being punted or sailed. A trip through the backwaters presents you an intimate peep into the typical Keralite ‘lifestyle, far from the mechanical monotony of bursting cities. You come across people living on the palm-fringed backwaters’ banks in colourful bungalows — punting their unique boats with bamboo poles. 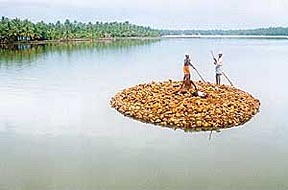 The dwellers are seen busy building country boats or ferrying products like coconut, rubber, spices, coir or rice in their unique boats. A large network of streams, canals, lagoons, lakes and rivers — these water bodies are loosely known in the local parlance as the backwaters. For centuries, these waterways have linked remote villages and islands to the mainland and important coastal areas. 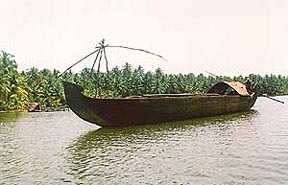 A unique way of travelling in the past, the backwaters continue to be used as an important means of travel and transportation. As you cruise along in calm backwaters, you come across children leisurely enjoying a dip or men deep in waters trying to catch fish with their bare hands. 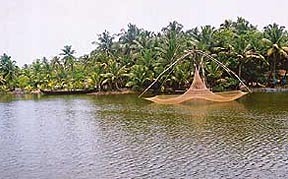 The Chinese nets line the banks of the waterways to attract the fish. The Kollam-Alappuzha route is the most enchanting and popular backwater cruise. Kollam, the southern gateway to the backwaters, is a small, shaded town with cashew and coconut plantations. 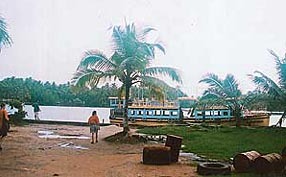 Kollam was once the capital of the Venad king. The Malyalam era is calculated from the founding of the Venad dynasty in the ninth century. The impressive journey, in a small cruise boat, begins at about 10 in the morning from Kollam and ends in Alappuzha, around 6 in the evening, taking about 8 hours; halting twice on the way, for lunch and evening tea-snacks. Alappuzha is a pleasant small town with a large network of canals. 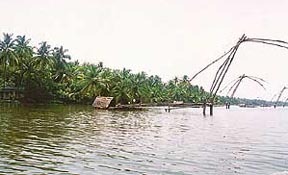 It is also the venue for the Kerala’s famous snake boat races. The trip takes you through narrow and beautiful lagoons, rivers and lakes. A major attraction of the cruise is that you come across a large number of beautifully built boats of different designs and sizes. The dwellers around the backwaters move around in small boats, punting them with long poles. While some big boats with motors are used by tourists and big traders. The kettuvallams or the traditional houseboats provide you the best possible accommodation in the waters and are an attractive feature of the backwaters. These houseboats are quite popular with honeymooning couples and families. Local boatmen here have also introduced a spruced-up version of the kettuvallam (covered canoes) which have most of the modern luxuries. In the monsoon, backwaters reverberate with the sound of the traditional snake boat races. The boats used for the races include the 130-feet-long chundan boats. Tourist guides tell you that these boats were designed for ancient naval battles fought in these backwaters. 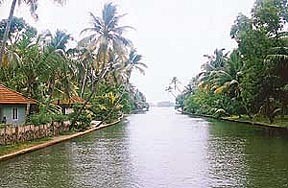 So once you go to Kerala, don’t forget that a life-time experience beckons you while you cruise the emerald backwaters!